The universe is a great Web of Life. You might argue that because so much of it is uninhabitable (dead rocks and nuclear furnaces) we should keep our discussion on the topic of life focused solely on our home planet. But we must remember that Earth is itself a product of the Universal Process which began some 14 billion years ago, and even if our planet was the only place where life exists across the entire 96 billion-light-year diameter of the observable cosmos, we are logically bound to the conclusion that the universe is alive. And conscious. And holding this thought, right now. The Web of Life, then, extends out into the cosmic surround, includes the whole earth, the vibrant system of living things called nature, and your body as an organismic member of this system. Your body can’t survive apart from the support of nature, nature can’t continue without the favorable conditions of Earth, the earth wouldn’t exist had not the universal process conspired in the way it did for our planet to get formed and flung around its home star. You may feel separate and all alone at times, but that’s something else, not your body. I have placed you in the above diagram, nestled in the Web of Life as an embodied and natural earthling, a child of the cosmos and latter-day descendant of stars. For now we’ll focus on the purple figure outlined in black, ignoring everything behind you and to the right. Black is my color code for your animal nature, which is extroverted in its orientation to the environment (nature, Earth, cosmos) as you reach out for the shelter, resources, and connections you need to live. Purple represents your inner awareness, oriented inwardly to the grounding mystery of consciousness. Also called the Ground of Being, it is how our provident universe is experienced from within, so to speak, in the uplift of existence. 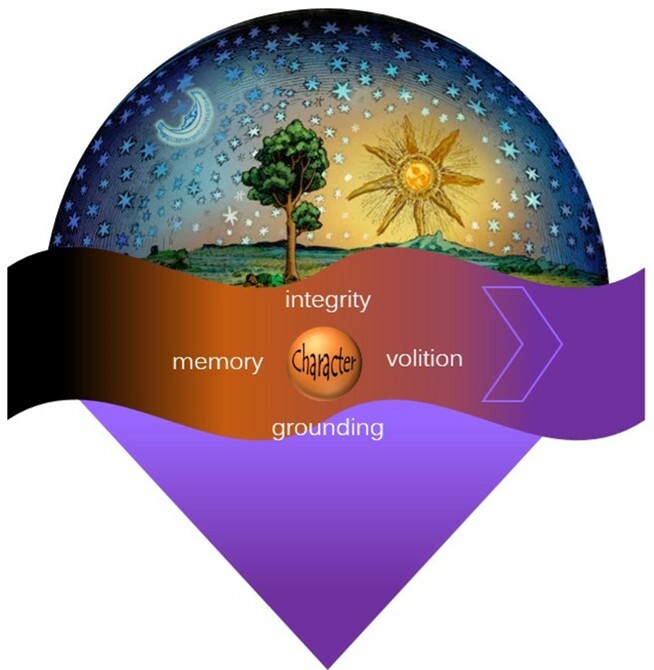 This grounding mystery of being can only be found within as you detach attention from the sensory-physical realm and allow awareness to drop past “mine” (property and attributes), “me” (the felt object of self), and “I” (the center of personal identity), into the deep and timeless present. Consciousness has no object at this point. Ground is merely a metaphor reflecting the experience of mystery as both source and support of existence in this moment. This duality of outer and inner orientations of consciousness, one through the body and out to the Web of Life, and the other through the soul and deeper into the Ground of Being, is what constitutes your essential self as a human being. You are a human animal (body) with a capacity for contemplating the inner mystery of being (soul). Because your highly evolved brain and nervous system make this dual orientation possible, you and your species may be the only ones with an ability to contemplate your place in the provident universe. I should be clear that it’s not entirely by virtue of your advanced nervous system that you are able to break past the boundaries of personal identity for a larger (Web) or deeper (Ground) experience of reality. You need a center of personal identity (color coded orange in my diagram) in place to make such transpersonal experiences even possible. We call them transpersonal precisely because they are about going beyond the personal center of identity and its limited frame of reference. The center is who you think you are, and the frame is a construction of meaning where your identity belongs. It is your world. Things get interesting at this point, and not just a little complicated, since ego formation is not an instinct-driven process, but instead depends on your tribe. The construction of identity and its frame of reference (world) is accomplished over the first three decades of your life. During that time your tribe is selecting or suppressing temperamental predispositions according to its standards of a ‘good boy’ or ‘nice girl’. As time goes on, the incentives for compliance evolve from candy or spankings, to grades, degrees, bonuses, and promotions. The goal is to shape you into “one of us,” someone who belongs, follows directions, and will do anything for the sake of honor. Even though your personal identity is a social construction, your tribe still had to work with (and on) an animal nature that really doesn’t care very much about rules and expectations. A strong instinct for self-preservation needed to be reconditioned so that you could learn how to share and make sacrifices. Impulses connected to elimination, aggression, and sexual behavior had to be brought under control and put on a proper schedule. The means for accomplishing all of this is called social conditioning, and the primary psycho-mechanism for its success is the ego. Somehow your constructed identity needed to be sufficiently separated from the animal urgencies of your body, but without losing the tether to your embodied essential self. This is where, in the deeper cultural history of our species, religion progressed out of animism and into theism. The higher power of a patron deity not only served to give supernatural sanction to tribal morality, but it functioned also as a literary role-model. I say ‘literary’ because patron deities live only in the storytelling imagination (aka mythology). Every deity is a kind of personality construct, a literary invention and projected ideal reflecting back to the tribe those character traits and virtues which the community aspires to emulate. In exchange for their worship, sacrifice, and obedience, the patron deity bestows favors and rewards (e.g., success in childbirth, bountiful harvests, increases in wealth, and beatitude in the next life). If we look closely at the patron deities of name-brand religions today, we can identify three qualities common to them all. Underneath and behind the tribe-specific virtues, its devotees honor their deity as immortal, supreme, and absolute. In the pictorial language of myth these translate into a depiction of the deity as separate, above, and outside the ordinary world of everyday concerns. An even closer look will reveal these qualities as the driving aspirations of ego as well. In the need to establish a separate center of personal identity, ego must first be differentiated from the body. Because the body is mortal, ego must be – or aspire to become – immortal. Notice that the ego’s status with respect to the body is ‘not’ (im-) mortal, a simple negation without any meaningful content. In addition to being separate from the body, ego takes its position above the body (the literal root meaning of the word ‘supreme’) and manages things from up there. Finally, as a final move of separation, ego begins to regard itself as essentially independent and outside the realm of bodily concerns – just like the deity. 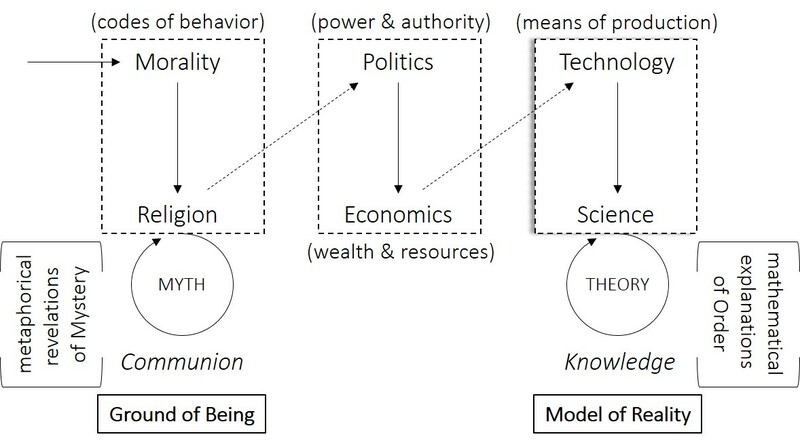 According to my theory of post-theism, the intended outcome of theism is the internalization of the patron deity’s ‘godly virtues’, to the point where its projected ideal is no longer needed. The individual assumes creative authority in his or her life, taking responsibility for modeling the virtues of maturity, ego strength, and community interest. This is especially important to up-and-coming theists (the younger generation), who need taller powers to show them how to be and what to do. Throughout this very fascinating game we can’t forget your essential self. The construct of identity can now serve in the transpersonal experiences of empathy, communion, and wholeness. If we can survive ego’s pursuit of immortal glory, these are the promise of our human future. The revelation that meaning is something we construct rather than uncover in the objective nature of reality marks a crucial breakthrough in our self-consciousness as creators. Such an apocalyptic realization can be found in myths that are thousands of years old, but until very recently the end of our world was regarded as a future event. Contrary to this literal-historical reading of the Apocalypse, I’ve argued that its function in our myths is to serve as a ‘veiled insight’ into our creative authority as storytellers. Now that the secret is out, we have an opportunity to create a new heaven and a new earth. The ability to see our myths as products of our own creative imagination, rather than naively looking through them and mistaking them for the way things really are, gives us a chance to appreciate them as art and ourselves as artists – or, even better, as artificers (inventors) of meaning and our human worlds. In this post I will identify the distinct registers of meaning that contribute to the tapestry we are weaving – individually, interpersonally with each other, in the company and traditions of our tribe, and those deep, slow rhythms of cultural mythology that carry our primal inklings as a species of belonging to a mystery we cannot fully grasp. It’s important to remember that cultures don’t compose stories, individual storytellers do. And yet, some insights into existence and our own creative authority – as in the example of seeing through the veil of meaning by the narrative mechanism of apocalypse – were planted in myth but depended on cultural traditions to preserve them over many generations before they could be demythologized and consciously understood. Obviously then, while we as individuals tell stories and live out our own personal myths from day to day, we can expect that some universal themes of our shared human condition are coursing through those idiosyncrasies as well. For instance, our deep inner life as a species is only accessible to us as individuals. 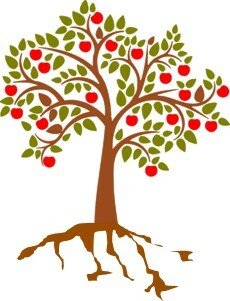 While numerous metaphors and concepts of a culture’s language are employed for the purpose of interpreting our experience of this grounding mystery, it is only by intuitive recognition (and not, say, technical explanation) that another individual can agree and feel profoundly understood. As a metaphor, the ground of being is our attempt to put into words an experience that is too deep for words and was intuitively known by us before we acquired the language to name and describe it; it is therefore essentially ineffable. This existential support and provident uplift of being felt within us is the source-experience behind all of our most treasured cultural representations of ultimate reality – of God as that upon which (or whom, when personified) our existence, life, and fulfillment depend. 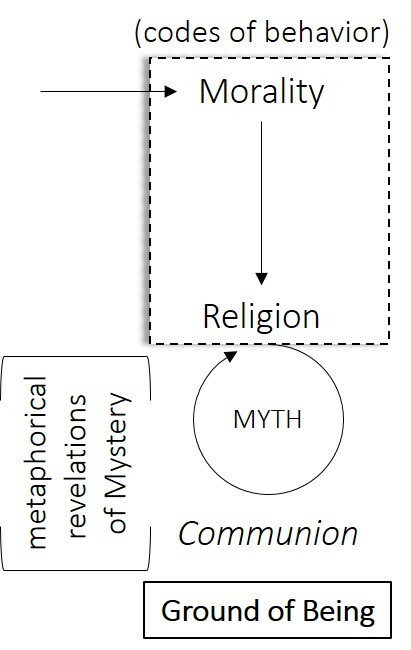 When these same representations are taken as literal descriptions of an external being, rather than as metaphorical depictions of the grounding mystery of being itself, the interpersonal recognition of truth, mentioned earlier, is bypassed for a tribal definition of god as the patron deity who demands our worship and obedience. Of whatever tribal origin and cultural background, mystics have been relentlessly critical of religious orthodoxies that claim to have the authorized version – all others are fakes and heresies – of the “one true god.” Their second mistake was to confuse these theological constructs for some objective being, but the real problem – we might think of it as the original sin – lay in trading away the validity of inner experience for an idol of language that could be standardized and mandated from above. 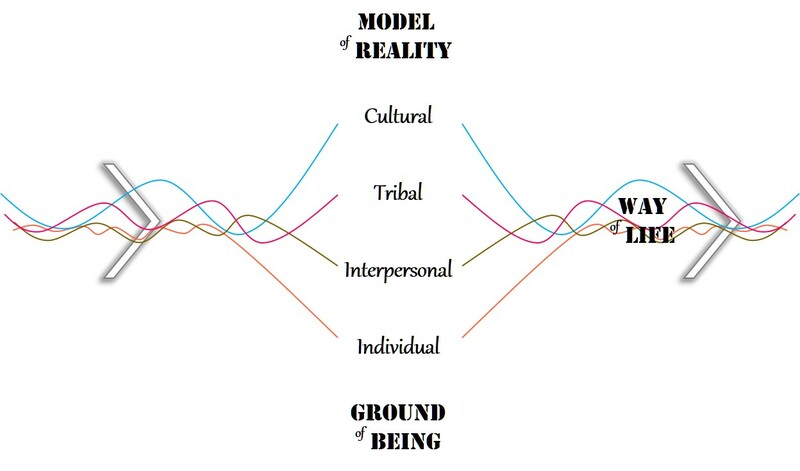 Over many generations of tribal life, a people constructs a model of reality that serves to orient them within the turning mystery of all things. 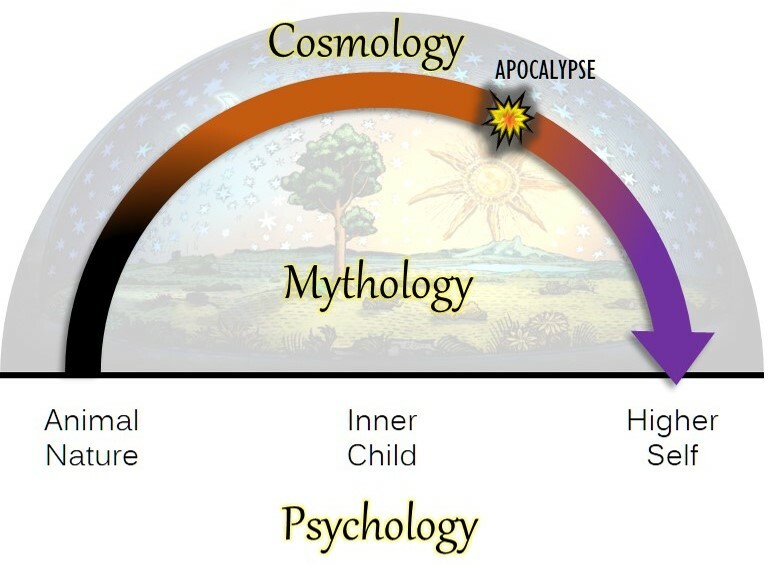 As cultural counterpart to the individual’s grounding mystery, a model of reality (or cosmology) functions as the universal frame in which space, time, life and destiny unfold. The great sacred narratives of mythology assume this model of reality as the framework underneath and behind their dramatic drapery, as the backgrounding map across, through, and against which the mythic action takes place. The up-and-down travels of the gods, divine messengers, religious heroes, and world saviors in the ancient Near East assumed a three-story model of reality. An account of Jesus ascending to heaven after coming up from the underworld with his victory over death, for instance, made perfect sense to its first-century audience. It’s been pointed out many times that because our present-day (scientific) model of reality is not so vertically arranged and neatly stacked, these early Christian myths strain the credulity of modern minds. Regardless of what defenders of orthodoxy maintain, it is decidedly not an act of faith to believe them anyway – or worse yet, to reject scientific cosmology in favor of the Bible’s literal truth. This is yet another complication brought on by the original sin of forgetting the origins of spirituality: a literal reading of myth locks the sacred stories to a model of reality that is no longer accurate, relevant, or believable. We either have to leave them behind as so much superstitious nonsense, or else abandon our own intellectual integrity for the sake of ‘keeping the faith’. 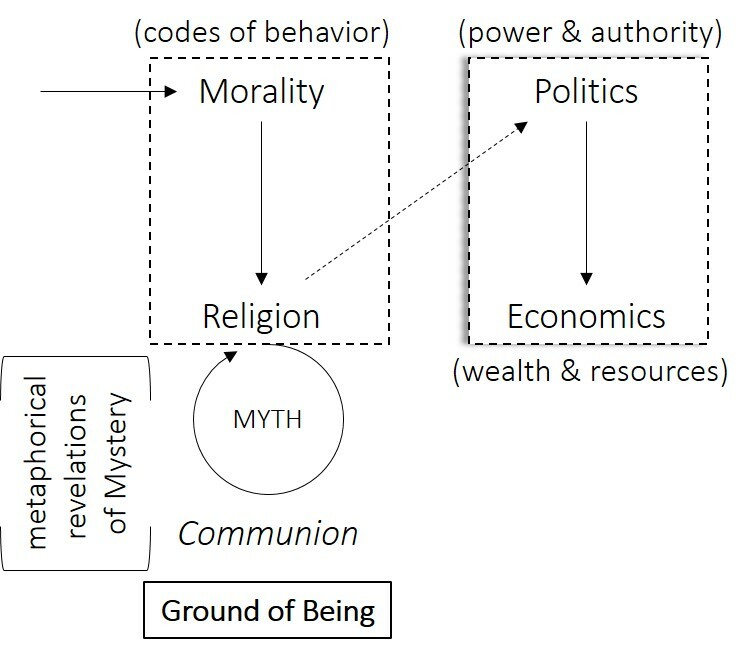 In the back-and-forth dialogue between an individual’s inner experience of the grounding mystery and the model of reality by which his or her culture is oriented in the turning mystery, the daily round of our life together in society (the interpersonal and tribal registers of meaning in my diagram) evokes the question of our ethical bearing. What, after all, constitutes a ‘good life’? Our actions and interactions either bring us together in community or push us farther apart. The choices we make as consumers, the votes we cast as citizens, and the company we keep around us are continually shaping who we are, individually and collectively. Our way of life is how we work out our dreams and pursue a meaningful existence. But, once again, if we are not internally grounded, and if we lack a sense of our place in the universe, our way of life and our life together can become a nightmare. Not inner peace, but chronic anxiety. Not holy wonder, but clinical depression. Not love, but suspicion, aggression, and violence against neighbors and nations. Psychospiritually adrift without grounding and orientation, we also lose the golden thread of our own personal myth and become susceptible to the extremes of conviction or complacency, simply because we have no real sense of ourselves. Instead of thinking ethically and with a greater good in mind, we twist morality around the pursuits of security and self-gratification. There is good news in all of this, which is that we can always wake up from the nightmare. We are living now at the end of the world, and it’s time to begin again. We don’t have to spin the scripts of yesterday or 2,000 years ago. A new day is dawning and we need better stories, so let’s get started. Just as soon as I make a case for the necessity of religion, it’s time to insist on our need to transcend it. If my atheist friends squirm at my insistence that we all have a religion – a system of beliefs, attitudes, values and practices that links the separate ego back to reality – my friends who are believers will shake their heads at my suggestion that we need to leave it behind. Why take the time to defend religion (not one or another religion, but religion itself) when the point is to go beyond it? A popular notion of religion conceives it as a means to an end, as a way through this world to another one. We trust that our religion will answer those really big questions and ultimately save our soul when the body gives out and our life on earth is over. Even a slight acquaintance with the history of religion should disabuse us of that fantasy, as the ‘soul rescue’ model came on the scene only very recently and is based on a dualism of body and soul which is probably less than 3,000 years old. For the greater part of its history religion has focused human concern on the challenges and opportunities of life on earth. Essentially it is about assisting human beings in the evolutionary work of “cultivating faith, nurturing love, and constructing meaning,” of reconnecting to reality and becoming real. 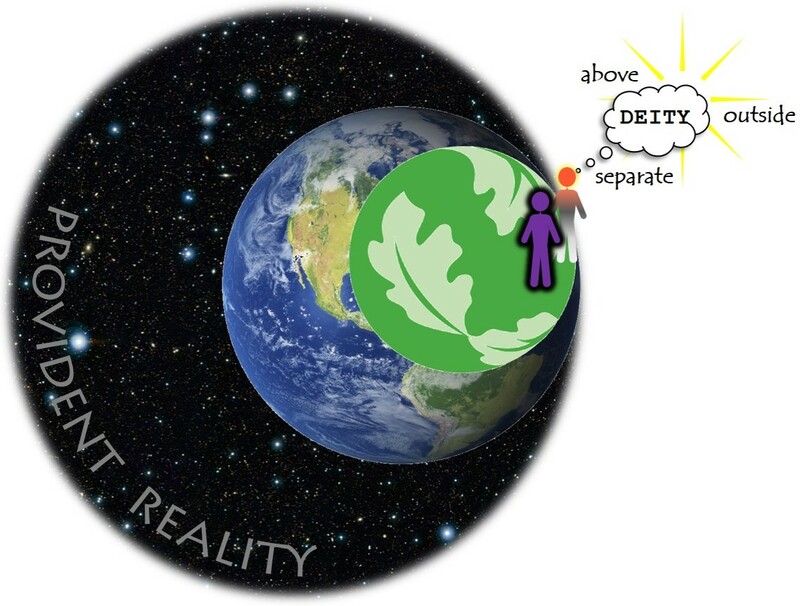 Why we might need to become real is more obvious when we understand the extent in which ego formation (the development of a separate center of self-conscious identity) removes us from the spontaneous stream of life experience and from the present mystery of reality. The rise of personhood and individuality is a slow arc across human cultural history, and religion functions to keep it from detaching pathologically from the mystical (contemplative), ethical (communal), and universal (cosmological) dimensions of our existence. Few critics of religion today recognize just how important it was during the formative stages of human evolution, not to mention how important it continues to be as our destiny unfolds. Just because certain aspects of religion, and even entire religions, may change or disappear as we progress doesn’t mean that religion itself is expendable. The question is not whether but how ego consciousness today is linked back to the grounding mystery within, to the living community of persons, and to the larger context of life on earth. Does our religion ‘work’ to this extent, or not? 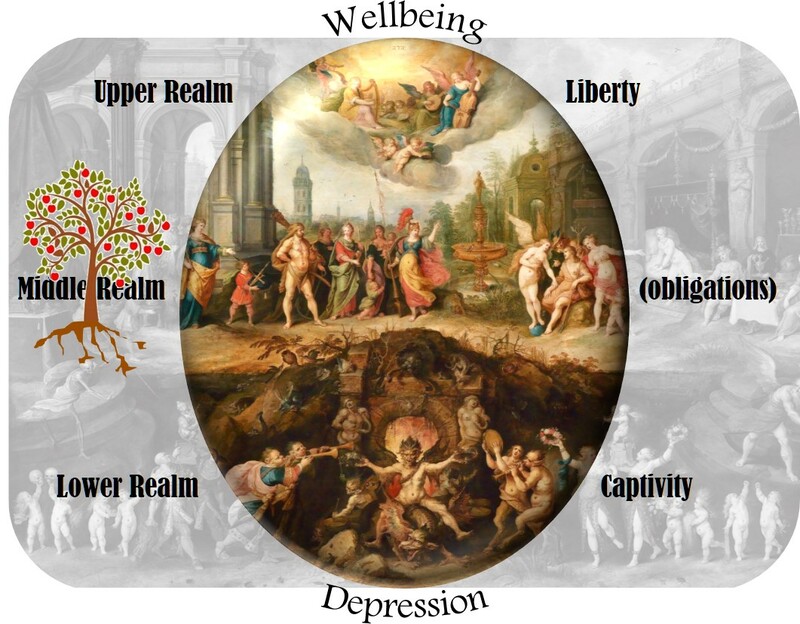 My diagram summarizes the ‘journey back to reality’ that healthy religion is intended to facilitate. The place to begin is at the bottom-right, where looped purple and black chain-links remind us of the essential nature of human beings as spiritual animals. We are not souls in bodies or bodies with souls, but sentient animals with a rich inner life. Our body is oriented by the senses in an extroverted fashion to the physical environment, while our soul opens consciousness to its own inner depths. In the dialogue of inner and outer, mediated by metaphor and story (myth), we perceive the oneness of all things and our place in the order of existence. Shifting over to the bottom-left and slowly swinging upward in the diagram introduces another piece of the puzzle, in that developing center of self-conscious identity (ego) mentioned earlier. 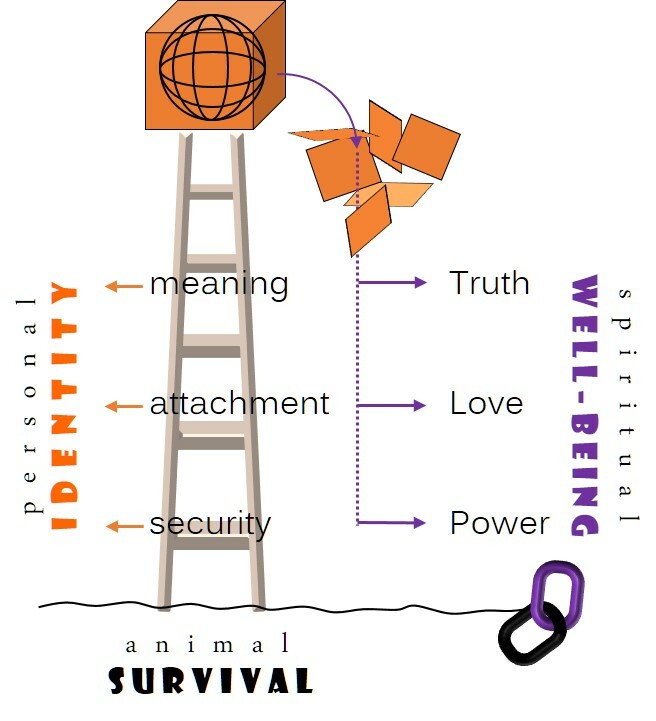 If ‘spiritual animal’ is what we are as human beings, ego identity is a quest for who we are – where we belong, to whom, as a member of which tribe, in what occupation, and so on. Early on, the tribe is most active in shaping our animal nature into a well-behaved dependent – a ‘good’ boy or girl who observes the rules of the game. Certain base impulses have to be restrained, or else channeled in ways that conform to the morality of tribal life. Our fundamental relationship to the body is established at this stage, as either something we can honor and enjoy, or instead feel unsure and ashamed about. The first separation in ego formation, then, is a separation of self-consciousness from the sensations, drives, and urgencies of the body. Ideally there is a general sense of security, where the emerging ego feels supported and valued as a member. But even in the well-adjusted individual some anxiety persists around the question (inarticulate at this point) of whether it’s really safe to trust, making security a chronic concern for the ego. We see this, for instance, in the infant that clings to its mother for safety and nourishment, unwilling to let go for fear of not having what it needs to survive. Attachment, then, is how ego compensates for insecurity, by latching onto whatever promises the unconditional support it has lost in the process of separation. Every ego thus carries an inherent self-contradiction: the separation necessary for establishing its own center of identity amplifies a deep insecurity, which ego then seeks to overcome by attaching to an external anchor – be it mother, family, nation, wealth, status, deity, heavenly reward, or whatever. The deeper the insecurity, the stronger and more desperate the attachment: a condition that interferes with and can completely undermine the process of healthy ego formation. This self-contradiction is usually resolved (perhaps only justified or explained away) by the construction of meaning that our tribe erects around us. As an obedient and honor-seeking member of the group, we should be willing – better yet, eager – to sacrifice everything in service to its idols and ideals. Insofar as religion can become a closed orthodoxy and a hierarchy of top-down control, it was inevitable that this natural course of human evolution (i.e., the rise of ego consciousness) would generate a crisis – and a worldwide one. Wherever the rising force of personal identity and individual freedom confronts a regime of moral repression and thought control, something needs to give. It’s important to understand, however, that because ego is inherently insecure to some extent, the framework of meaning it comes to inhabit and defend as its personal world is not wide open to reality, but just as small and simplified as it needs to be. 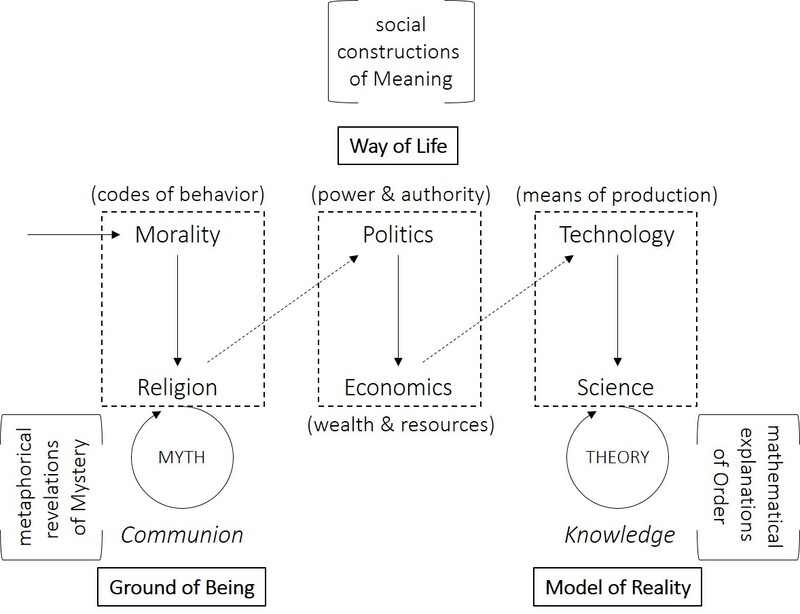 In my diagram, a ladder of ego development leads up into a more or less coherent worldview (symbolized by a sphere) held inside a set of beliefs concerning ‘the way it is’ (symbolized by a box around the sphere). Even a healthy personality, exhibiting the telltale signs of ego strength (stable, balanced, and unified), is separated from reality by its world construct. We don’t need to demonize the ego and make it the cause of all our trouble, as some world religions have done. The goal of ‘salvation’ (referring to the process of being set free and made whole) is not to cancel or reverse what ego formation has accomplished, but rather to transcend personal identity and reconcile consciousness to reality once again. I say ‘once again’, but in fact the connection this time is conscious and intentional, whereas its pre-egoic state was unconscious and spontaneous. By definition, nothing is separate from reality, which means that ego’s separate identity is actually (in the words of Albert Einstein) “an optical delusion of consciousness.” This is what needs to be transcended. Having made our way to the top of my diagram, we can now follow the path of our journey back to reality. To really see things as they are, the veil of meaning that separates us from reality (or to use a related analogy, the mental labels we affix to things and other people) must be pulled aside. What is revealed, then, is perfectly meaningless: reality in all its glory, the pure radiance of being. Truth is always beyond meaning, and our meanings are true only insofar as they accurately represent the way things really are. And yet, even the most accurate representation is still just a representation; the present mystery of reality transcends all media of thought, language, art, and theory. It is ineffable. When we are liberated from the constraints of belief, prejudice, and unrealistic expectations, other persons can be respected as free individuals rather than as emotional attachments that protect or ‘complete’ us. Such open and sacred regard for others, expressed as empathic care for their health and well-being, is what we call love. Genuine love and community is a dynamic of freedom, trust, kindness, and honesty between individuals. It isn’t ‘blind’ at all, but profoundly clear-sighted. Attachment is what makes us blind to others, regarding them only as we need them to be – how reassured, desirable, important, or threatened they make us feel. If truth is the way things really are behind the meanings we impose on them, and if love refers to a genuine human connection that is free from neurotic attachment, then power, as the opposite of insecurity, has to do with our conscious connection to the grounding mystery within. Paul Tillich expanded the notion of being (taken as a verb rather than a noun) as ‘the power to be’, interpreting existence (from existere) as the place where reality manifests (or ‘stands out’) in this or that thing. Much of mystical spirituality might be characterized as an inward descent of consciousness, dropping past the identifications of ego, into the deeper registers of inner life until the wellspring of being-itself is reached. Our quest for identity sets the stage, as it were, for our journey back to reality. As the quest is our preoccupation during the first half of life, the journey will (or perhaps I can dare say, should) serve as the orienting metaphor for a spirituality of the second half. Yes indeed, we will occasionally get hooked into the drama of ‘me and mine’ – much more frequently than we would care to admit – losing our way time and again. But soul seeks truth, not meaning. It celebrates love, not possession. And it rests quietly in being, in the secret source of power.